To sign up for Meridian’s free executive summary update: Please CLICK HERE. The Smiths settle on a farm in Kirtland. Joseph, Samuel, and Hyrum leave on missions for Missouri. Lucy Mack Smith inserts a number of revelations given at this time concerning the building up of Zion, the keeping of the commandments, and the preaching of the gospel among the congregations of the wicked, including, in part or whole, D&C 52, 58, 59, 60, and 61 of the Doctrine and Covenants. 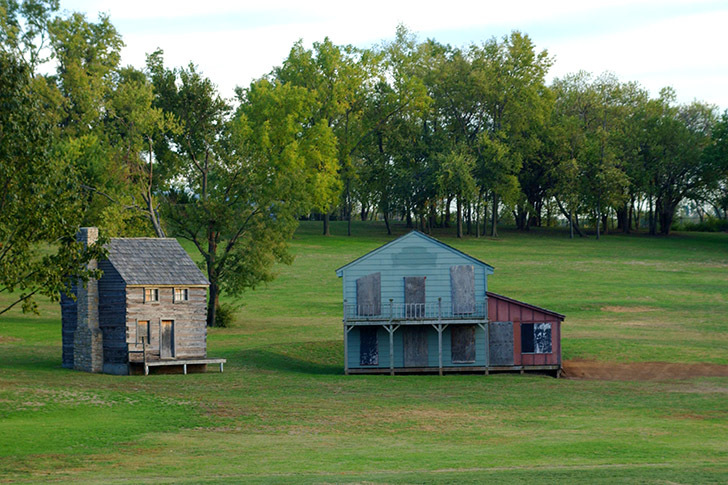 Houses built on the original temple lot in Independence, Missouri as props for a pageant. These give a sense of the building of a settlement on the western frontier. The Missouri River, pictured here, became a route of travel to head back east towards St. Louis, Missouri. Near here the brethren experienced the dangers on these waters. This revelation was given June 7, 1831, and is now known as D&C 52 of the Doctrine and Covenants. Mother Smith gave instructions in the Preliminary Manuscript to include extracts from several revelations at this point in her history. Two paragraphs have been added in this chapter to give a bridge of continuity between them. They have been correspondingly footnoted as they appear. This first conference in Missouri was held on Thursday, August 4, 1831, in the home of “Brother Joshua Lewis, in Kaw township, in the presence of the Colesville branch of the Church” (History of the Church 1:199). Joshua Lewis, born in 1795, was one of the early settlers of Jackson County and converted to the Church through the efforts of the Lamanite missionaries (Ziba Peterson, Peter Whitmer Jr., Oliver Cowdery, Parley P. Pratt, and Frederick G. Williams) in late fall 1830 (see Papers, pp. 497-98). Quincy, Illinois, would, nearly eight years later, be a place of refuge for thousands of the Saints who had been driven from Missouri. Mother Smith instructed in her Preliminary Manuscript that “suitable extracts” be taken from this revelation and be inserted into the history. For a full reading of this revelation, see D&C 58:1-65. This was a foreshadowing of all that would transpire in Missouri. The spot for the temple was dedicated on Wednesday, August 3, 1831. The 87th Psalm was read and Joseph recorded: “The scene was solemn and impressive.” (History of the Church 1:199.) This was the humble beginning of laying the foundation for the great Zion, the New Jerusalem that prophets through the ages had seen in vision and hoped and longed for. Here, on that obscure summer day, on a small plot of land in a frontier wilderness, and unknown to the world, the small beginning was laid for the city of God which will someday become the envy of all nations. This revelation was given on the Sabbath day, August 7, 1831. Mother Smith instructed in her Preliminary Manuscript that “suitable extracts” be taken from this revelation and be inserted into the history. For a full reading of this revelation, see D&C 59:1-24. These first verses are especially poignant and personal. Polly Knight, stalwart and faithful wife of Joseph Knight Sr., and a member of the Colesville, New York, Branch of the Church, had desired with all of her soul to see Zion, but her health had been failing quite rapidly. The twelve-hundred-mile journey was arduous. Newel Knight recorded: “She would not consent to stop traveling; her only, or her greatest desire was to set her feet upon the land of Zion, and to have her body interred in that land. I went on shore and bought lumber to make a coffin in case she should die before we arrived at our place of destination-so fast did she fail. 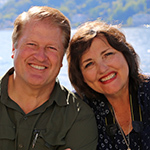 But the Lord gave her the desire of her heart, and she lived to stand upon that land.” (History of the Church 1:199.) She died on Saturday, August 6, 1831, and was buried the next day. Following the funeral on that day, this revelation was given. The bridging paragraph here is taken from the headnote to D&C 60 in the 1981 edition of the Doctrine and Covenants. 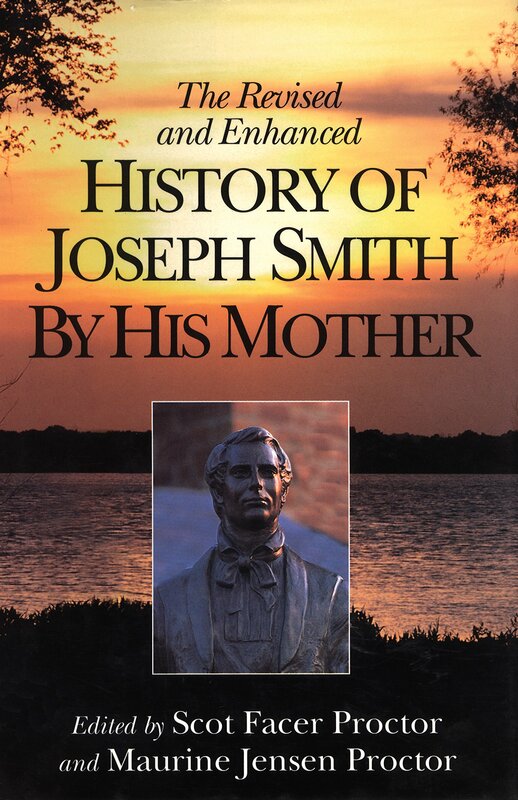 Mother Smith instructed that the whole revelation, D&C 60 of the Doctrine and Covenants, be inserted in the history. None of the preceding editions have included this. This paragraph has been inserted from History of the Church 1:202-3 to create a bridge for continuity between the revelations Lucy directed be included in her history. This revelation, D&C 61 of the Doctrine and Covenants, was given on Friday, August 12, 1831. It must be noted that Samuel Harrison Smith passed away on July 30, 1844, just thirty-three days after his brothers Hyrum and Joseph were killed. Lucy recites with pride, poignance, and in the past tense as she comments about her martyred sons.